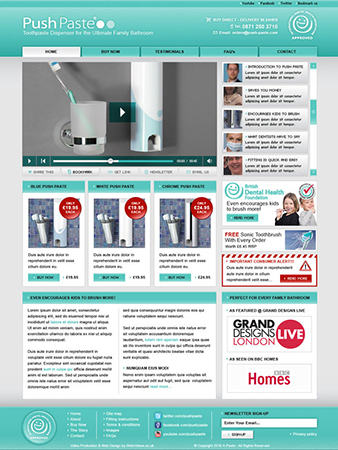 The client approached WebVideos with a brief to create a series of promotional & informative videos plus 2 video-centric websites to promote both the Push-Paste & X-Paste Toothpaste Dispenser. Eash individual product was aimed separate market sectors so the videos & website had to be similar but different. The client requested that the each separate website be design similar to each other and to be implemented within a content management framework. Working closely with the client, we initially went through the process identifying the videos to be produced & how we would go about filming them. We then about writing the scripts with the client being involved deeply in the scriptwriting & amendments process to ensure the correct messages were being conveyed. Simulaneously our designers were also designing the 2 websites which would house the rest of the content for the products. 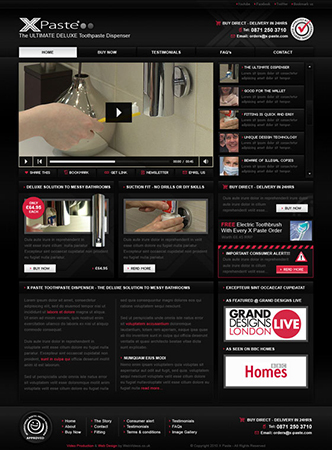 In keeping with products brand identity, the location for filming the promotional explainer videos was pre-approved by the client as CP Hart Bathroom Showrooms, which is located Waterloo, London. Again, working alongside the client, we selected a number of presenters that would adequatley present the product in the correct demographic light. We spent all day at the showroom filming with a cast & crew of about 20 people which included a number of children. Designing & Building the Websites: the 2 websites were designed in such a way as to be able to replicate the Push-Paste site and to then be able to ammend the images & content in order to successfully produce the X-Paste website. This made streamlining the production process much easier and also reduced the end cost to the client considerably. The websites were built for and implented in the pre-approved opensource content management system, Joomla. Doing this enables the client (with a little training) to go into the website and make their own minor ammendments to images, text & to create new pages with paying addtional cost to a web company. Bespoke Flash Video Multi-player:The client requested that the videos all be available for viewing from the home page of each website and that the delivery system shouldn’t compromise the overall website design. Our flash developers designed and created a multi-player video delivery application which also included integrated social network bookmarking for facebook, twitter etc… plus email function, copy link and browser bookmarking.